Johns Hopkins Global Digital Health Initiative, Baltimore, MD, USA. Department of Community and Family Medicine, Duke University School of Medicine, Durham, NC, USA.Center for Health Policy and Inequalities Research, Duke Global Health Institute, Durham, NC, USA. Johns Hopkins Bloomberg School of Public Health, Baltimore, MD, USA.Johns Hopkins School of Medicine, Baltimore, MD, USA.School of Medicine, American University of Beirut, Beirut, Lebanon. Background: Delivery of high-quality efficient health services is a cornerstone of the global agenda to achieve universal health coverage. According to the World Health Organization, health service delivery is considered good when equitable access to a comprehensive range of high-quality health services is ensured within an integrated and person-centered continuum of care. However, good health service delivery can be challenging in low-resource settings. In this review, we summarize and discuss key advances in health service delivery, particularly in the context of using digital health strategies for mitigating human resource constraints. Methods: The review updates the foundational systematic review conducted by Agarwal et al. in 2015. We used PubMed, EMBASE, and CINAHL to find relevant English-language peer-reviewed articles published 2018. Our search strategy for MEDLINE was based on MeSH (medical subject headings) terms and text words of key articles that we identified a priori. Our search identified 92 articles. After screening, we selected 24 articles for abstract review, of which only 6 met the eligibility criteria and were ultimately included in this review. Results: Despite encouraging advances in the evidence base on digital strategies for health service delivery, the current body of evidence is still quite limited in 3 main areas: the effectiveness of interventions on health outcomes, improvement in health system efficiencies for service delivery, and the human capacity required to implement and support digital health strategies at scale. Two particular areas, digital health-enhanced referral coordination and mobile clinical decision support systems, demonstrate considerable potential to improve the quality and comprehensiveness of care received by patients, but they require a greater level of standardization and an expanded scope of health worker engagement across the health system in order to scale them up effectively. Conclusions: Additional research is urgently needed to inform the effectiveness of interventions on health outcomes, improvement in health system efficiencies, and cost-effectiveness of service delivery. In particular, more documentation and research on ways to standardize and engage health workers in digital referral and clinical decision support systems can provide the foundation needed to scale these promising approaches in low- and middle-income settings. In this review, we summarize and discuss key advances in health service delivery, particularly in the context of using digital health strategies for mitigating human resource constraints. We focus the discussion on clinical decision tools and digital referral systems and how recent innovations within these areas have contributed to improvements in health service delivery. We also analyze and discuss gaps in the current evidence base on the effectiveness of the digital health service delivery interventions on health care use, efficiency, and outcomes. Finally, we provide recommendations for and highlight challenges in scaling up digital health service delivery strategies within health systems. The purpose of this literature review is not to serve as a comprehensive systematic review of all relevant published articles but rather to identify important new evidence on digital strategies for health service delivery that may advance the current body of knowledge and practice. 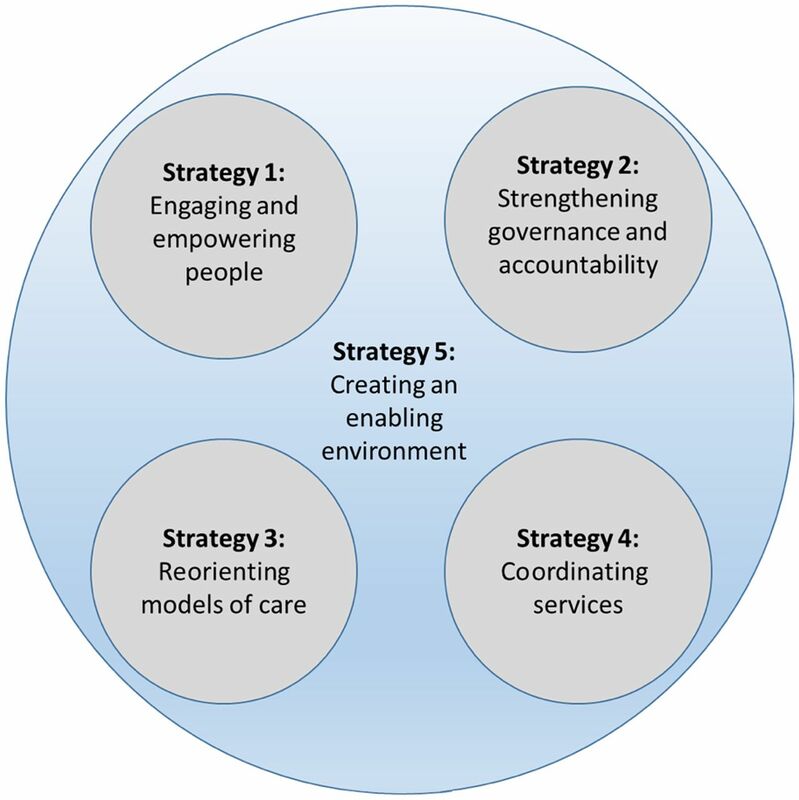 The scope of the review was based on the framework on integrated patient-centered health services.6 This framework includes 5 potential areas of strategic focus.6 Digital health interventions, which support a model of care (strategy 3, mobile clinical decision support systems) and coordination of health services (strategy 4, digital referral systems), are discussed in this review. Other reviews in this supplement describe digital health interventions for demand generation (strategy 1) and governance (strategy 2). For this review, we included peer-reviewed studies from high-, middle-, and low-income countries, which described implementation and evaluation of digital strategies for improving health service delivery (Figure). The scope of the literature review was based on 5 potential areas for strategic focus from the WHO framework of integrated patient-centered services. Our review is based on the foundational systematic review done by Agarwal et al. in 2015.7 Our search strategy incorporated the key search terms from the Agarwal et al. review, which included variations and combinations of terms for mHealth (mobile, phone, cell phones, information and communication technology, cellular phone, mobile device, SMS, text message, interactive voice response) and health workers (frontline worker, health worker, community health worker, traditional birth attendants, lay worker, village health worker, midwife, health auxiliary, peer health worker, medical auxiliary, health provider, lay advisor, lay counselor, lady health worker, and lay educator).7 To this, we added variations and combinations of key search terms for service delivery (health service, service availability, service readiness, health facilities, service quality, service coverage, service coordination). We then updated the review via a literature search using the databases on PubMed, EMBASE, and CINAHL for relevant publications published between 2015 and 2018. We restricted our searches to studies published in English and developed a search strategy for MEDLINE based on MeSH (medical subject headings) terms and text words of key articles that we identified a priori. The updated search resulted in 92 peer-reviewed articles. One of the authors screened the articles and identified 24 abstracts for final review. Two of the authors worked independently and in duplicate to review titles, abstracts, and full-text versions of the identified articles. The inter-rater agreement was 92%. The discrepancy was with 2 articles. After a face-to-face discussion, the reviewers agreed that the 2 studies should be excluded because the studies reported on feasibility and pilot study protocols that did not add to the body of evidence about health care delivery using digital health. Only 6 articles met the eligibility criteria for the review. Agboola et al.47 conducted a randomized controlled clinical trial and used SMS messages to coach and monitor patients with type 2 diabetes with HbA1c levels of >7 to achieve physical activity goals. There was no significant difference in change of HbA1c levels or monthly step counts in the 6-month follow-up between the intervention compared to the control group.47 Arora et al.48 and Capozza et al.49 also used SMS in randomized controlled clinical trials to educate, motivate, and achieve glycemic control, however they showed no statistical improvement in HbA1c. All of these studies were conducted in high-income countries. Despite encouraging advances in the evidence base on digital strategies for health service delivery, much of the literature remains focused on the use of descriptive data or intervention potential rather than objective measures. As described previously, health providers from low-resource settings face multiple barriers to the delivery of high-quality efficient health services. These barriers may include: health care providers' limited access to timely and relevant health information; a shortfall of appropriately trained health care workers, especially in rural and remote areas; and the consequential transfer of responsibility for primary health care service delivery to lay health care workers who have little to no health service-related training.54 Even in settings where health care workers may have adequate training, it may be difficult for them to learn of new evidence and apply it consistently and correctly across a range of disease groups. Mobile clinical decision support systems (CDSS) have potential to mitigate these barriers. CDSS is an “electronic system” designed to aid directly in clinical decision making, in which the characteristics of individual patients are used to generate patient-specific assessments or recommendations that are then presented to clinicians for consideration.55 The concept behind CDSS is not novel. Clinical decision support tools have been used in hospital-based settings with varying levels of sophistication in high-income countries for several decades.56 However, employing CDSS on mobile devices can provide opportunities for such tools to become available in areas with limited infrastructure and outside of hospital- or clinic-based settings. As task shifting from a higher cadre of trained providers to lay health workers is increasingly supported, mobile CDSS (mCDSS) can provide novel opportunities to continually train and support these lay health workers. Providing CDSS on mobile phones may serve a range of functions, including guiding health care providers through process algorithms using if…then rules based on evidence-based protocols, providing a checklist based on extant clinical protocols, or providing step-by-step guidance to screen clients by risk status using predetermined models. An mCDSS application may be stand-alone—to be used at a single point in time to deliver services—or may be integrated with a longitudinal health record, where any information that is entered into the system at a single point in time can be retrieved and used for making decisions during a follow-up visit. Systems that combine mCDSS with health records can facilitate long-term care and support the appropriate referral of clients at different levels of the health system. For example, an intervention developed in partnership with the Tanzanian Ministry of Health and Social Welfare provided community health workers with a mobile job aid to counsel, screen, and provide health-facility referrals to women at the community level for pregnancy, sexually transmitted infections, and family planning services. The data collected during these routine community-level service-provision visits were stored in electronic forms and sent to a central server that could be accessed by district-level health staff.57 This type of intervention improves not only the quality and comprehensiveness of services provided by lay health workers at the community level but also facilitates appropriate linkages to care and management at the facility level. mCDSS can guide health care providers through process algorithms, provide a checklist based on extant clinical protocols, or provide step-by-step guidance to screen clients by risk status. While mCDSS tools are promising, the challenge of transitioning from paper-based health records and decision-support tools to digital systems must not be underestimated. Despite efforts to make the mCDSS user-interface accessible and user friendly, the learning curve to adopt digital systems is often steep and requires ongoing training and support. To function well, such systems need to be iteratively developed, take into account user feedback, and align closely with existing clinical protocols. The learning curve to adopt digital systems can often be steep and requires ongoing training and support. The broader challenge of long-term adoption and scale up is how to ensure digital records are considered official records by ministries of health. As digital systems are tested, managers of health systems are often reluctant to dispose of existing paper systems. The result is that health care workers are then required to enter the same information in both paper and digital systems, adding to the responsibilities of the already overworked frontline health workers. Appropriate efforts must be undertaken to prove that digital records are as or more accurate than paper records. While mCDSS may be promising, the adoption of digital systems relies on understanding whether these systems can work in their specific context or environment, and if the systems can be effectively rolled out at scale. Digital referral systems enable client health needs to be managed in a comprehensive manner using resources beyond those available at the patient's initial access to care. It is important to note that referral management and coordination is not an isolated process. It is embedded within the context of proper diagnosis, patient support, and post-treatment follow up.59,60 When these related processes are inadequate, they can impact the effectiveness of referral systems. In health systems that are still reliant on paper-based data collection systems, there is a limitation to the degree in which patient referrals can truly be coordinated: paper referral forms can get lost, delays in paper-based information arriving at the right level of care may occur, and low levels of literacy can create challenges in comprehension.61 Furthermore, the failure of patients to complete the full care plan in line with their initial diagnosis can often be attributed to a breakdown of referral processes.62,63 The reasons behind these breakdowns can be complex and multifactorial: referrals to clinic may not account for distance clients need to travel, clients may not be able to afford the means to travel to the clinic, clients may not be able to afford taking time off from work or have child care arrangements to be able to follow up with the clinic, and the client or caregiver may not understand the referral instructions. Enhancing referral coordination activities with digital health systems can help overcome substantial barriers to strengthening referral services. Within the body of research included in this review is a wide array of digital health referral coordination systems that focus on health domains ranging from maternal and child care to noncommunicable diseases and dental care. The primary users of the digital referral systems in these studies included community health workers, clinical officers, nurses, and medical doctors. Several articles describe the improved effectiveness of digital referral systems over the standard of care. For instance, in Zambia, researchers reported a marked improvement in referrals for patients as a result of using coordinated digital health referral coordination systems.62 In addition, the digital referral system removed barriers to arranging referrals faced by health care providers by improving the providers' ability to communicate with others, preparing patients for care, and changing plans for referral activities quickly, if needed. Similarly, in Zanzibar, the authors noted that an increased proportion of women completed the recommended 4 antenatal care visits, leading researchers to believe that digital health interventions could contribute toward the overall improvement of maternal health.64 These findings present a strong case to assess the feasibility of scaling referral system. Even with the implementation of digital referral systems, several challenges related to data completeness remain that limit our ability to assess the effectiveness of these systems. Standard reporting formats typically provide a limited assessment of referrals as a health performance indicator. For instance, referrals are often recorded based on their status (e.g., as complete or incomplete), without providing the details of the nature of the referral, completion of the counter referral, or outcome for the patient. The lack of detailed information prevents an accurate assessment of the quality of health service delivery to the patient. In other cases, referral data may be binary, only counting referrals made, and, occasionally, referrals completed. These types of data sets fail to provide the information required to understand the impact of digital referral systems on improving service delivery, health outcomes, and, importantly, health systems strengthening activities aimed at achieving universal health coverage. Binary referral data fail to provide the information required to understand the impact of digital referral systems on improving service delivery, health outcomes, and health systems strengthening activities. The limited choice of available software and lack of standardization, in terms of data collection and integration, also poses a significant challenge to scaling digital referral systems.62 The studies in this review deployed referral systems using different and noncompatible digital health software, and none of the systems collected data in the same format.62,64–68 In some cases, these divergent approaches were implemented in the same country, resulting in unnecessary duplication and limiting opportunities for integration and scale up. Additionally, the literature review revealed gaps related to how referral systems engage patients along the full continuum of care—from the point of initial contact to treatment and management. Two studies included in this review focused on community health workers as the primary referral points for patients and tracked whether patients arrived for treatment at the next level of the health system.62,68 However, they provided limited to no information about whether the health workers at the next level of care received the patient successfully or whether the treatment was provided to the patient as intended. For example, in Uganda, researchers conducted a detailed review of the number of children who were referred for treatment for malnutrition. The study's metric for success was the overall number of referrals completed during the duration of the study.62,68 These metrics, however, failed to capture a clear picture of the patient's engagement with the health system. Hence, future implementers and evaluators of digital referral systems must consider how to generate data that are beneficial for quality improvement and not limit themselves to proximal indicators in the pathway to care. Despite the increased proliferation of mobile phones and affordability of mobile broadband technology in low- and middle-income countries, only about 30% of the global rural population currently has mobile phone access, compared to approximately 90% of the urban population,69 and this level of unique mobile-cellular subscriptions is insufficient to support universal access. These trends are particularly important to note when considering the delivery of health services through digital health programs. Ultimately, for digital health strategies to be instrumental in the achievement of universal health coverage goals, a better understanding and stronger emphasis on how they can be used to deliver large-scale, timely, and comprehensive health services to both rural and urban populations will be required.70 The Table summarizes key published articles that discuss digital referral systems and mobile clinical decision support systems. For digital health strategies to be instrumental in the achievement of universal health coverage goals, we need to better understand how they can be used to deliver large-scale, timely, and comprehensive health services to both rural and urban populations. The current body of evidence on digital strategies for health service delivery is still quite limited in 3 main areas: the effectiveness of interventions on health outcomes, the improvement of health system efficiencies for service delivery, and the level and type of human capacity required to implement and support digital health strategies at scale.7,51 Additional research is urgently needed to inform these gaps and to show the cost-effectiveness of digital health interventions to provide and support service delivery. Digital health interventions for service delivery, such as digital health-enhanced referral coordination and mCDSS, demonstrate major potential to improve the quality and comprehensiveness of care received by patients. However, these digital health interventions require a greater level of standardization to prepare for scale and an expanded scope of health worker engagement to include more levels of health service delivery. These specific enhancements, if researched and documented, can provide the foundation needed to scale effective digital referral coordination and decision support systems within low- and middle-income settings. Disclaimer: The content is solely the responsibility of the authors and does not necessarily represent the official views of the World Health Organization, Duke University, The Johns Hopkins University, or The American University of Beirut. World Health Organization (WHO). Monitoring the Building Blocks of Health Systems: A Handbook of Indicators and Their Measurement Strategies. Geneva: WHO; 2010. http://www.who.int/healthinfo/systems/WHO_MBHSS_2010_full_web.pdf. Accessed September 6, 2018.
. Improving Standards of Care with Mobile Applications in Tanzania. Paper presented at: W3C Workshop on the Role of Mobile Technologies in Fostering Social and Economic Development in Africa; April 1, 2009; Maputo, Mozambique. https://www.w3.org/2008/10/MW4D_WS/papers/dtree.pdf. Accessed September 6, 2018. Interactive Research and Development (IRD), Stop TB Partnership. mHealth to Improve TB Care. Karachi, Pakistan: IRD; 2012. http://www.stoptb.org/assets/documents/resources/publications/acsm/mHealth%20to%20Improve%20TB%20Care.pdf. Accessed September 6, 2018.
International Telecommunication Union (ITU). ICT Facts Figures 2017. Geneva: ITU; 2017. https://www.itu.int/en/ITU-D/Statistics/Documents/facts/ICTFactsFigures2017.pdf. Accessed September 6, 2018. World Health Organization. Framework on integrated people-centred health services. Report by the Secretariat. 69th World Health Assembly provisional agenda item 16.1. A69/39. http://www.who.int/servicedeliverysafety/areas/people-centred-care/framework/en/. Published April 15, 2016. Accessed September 6, 2018. Global Health Workforce Alliance, World Health Organization (WHO). A Universal Truth: No Health Without a Workforce. Geneva: WHO; 2014. http://www.who.int/workforcealliance/knowledge/resources/GHWA-a_universal_truth_report.pdf?ua=1. Accessed September 6, 2018.
. Rapid Assessment of Referral Care Systems: A Guide for Program Managers. Arlington, VA: Basic Support for Institutionalizing Child Survival Project (BASICS II) project, John Snow, Inc.; 2003. http://www.who.int/management/facility/RapidAssessmentofReferralCareSystems.pdf. Accessed September 6, 2018. World Health Organization (WHO). Referral systems – a summary of key processes to guide health services managers. Geneva: WHO; date unknown. http://www.who.int/management/Referralnotes.doc. Accessed September 8, 2018. Global Health Workforce Alliance, World Health Organization (WHO). Global Experience of Community Health Workers for Delivery of Health Related Millennium Development Goals: A Systematic Review, Country Case Studies, and Recommendations for Integration into National Health Systems. Geneva: WHO; 2010. http://www.who.int/workforcealliance/knowledge/publications/CHW_FullReport_2010.pdf. Accessed September 6, 2018.
International Telecommunication Union (ITU). ITU releases 2015 ICT figures: statistics confirm ICT revolution of the past 15 years [press release]. ITU website. http://www.itu.int/net/pressoffice/press_releases/2015/17.aspx. Published May 26, 2015. Accessed September 6, 2018.